You are here: Home / Knowledge Base / BLOG: Luckiest Duck; by Sebastian’s mom, includes multi-allergen OIT and what to bring on the first day. 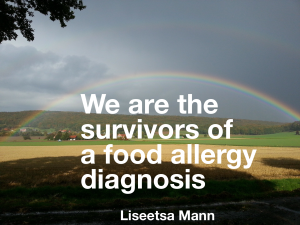 Multi-allergen OIT or mOIT has been done for a few years now by a some of our pioneering doctors, and without drugs. Many only do one allergen at a time, but more and more are doing combinations at the same time with great success. This allows great freedom when completed! We are still in OIT! Since my last post we’ve had a couple itchy eyes, a sneeze, a burp one tummy ache, a couple loose stools and zero scary reactions! We just finished our sixth OIT office visit. According to our protocol, if all goes well we will “graduate” in eleven more visits. I hope we’ll be finished in mid-December. I am a bit nervous now that we’re in the 25-50 mg of peanut zone. I’m hoping to see no signs of EoE. Two updoses ago Sebastian switched from cashew liquid solution to powdered cashew in capsules. Yesterday he switched to powdered walnut. I love having two fewer oral syringes to wash twice a day! I have to open the capsules and mix the contents into a spoonful of applesauce, pudding, etc. Our first day home with the cashew capsules I mixed the dose into a spoonful of yogurt. He complained the powder was “spicy” which I thought was his way of describing an oral reaction. I tasted a tiny bit of the yogurt myself and I could see what he meant with his description. According to the bottle’s label the cashew had been mixed with sodium bicarbonate (baking soda), I suppose to give it bulk and keep it fresh. The baking soda reacts a bit with the yogurt. We switched to mixing it with pudding. My non-FA daughter thinks she needs pudding twice a day too! Beating back these life threatening food allergies (one mg at a time) is so very empowering!